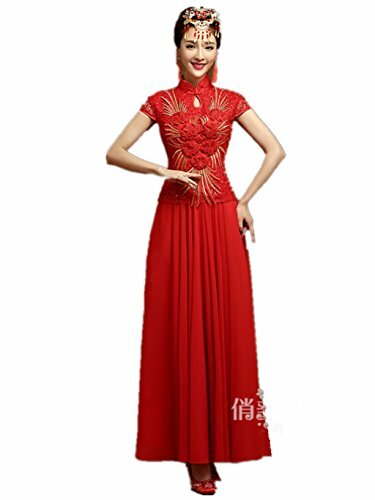 （3）Refined design,Exquisite hand embroidery,Phoenix pattern, Classic red color. Three-dimensional cutting。 Exquisite and unique process. Manual suture.Make you slender and slim. Inherited more than two thousand years of Chinese cheongsam costume culture. Let you show noble elegant. （4）Style: Retro,Traditional. National style, Close waist design, Big swing, Short sleeves. Stand collar, Water-drop hole. （5）Suitable occasion: wedding, banquet, hosting activities, attending activities performance, etc. Suitable for four seasons wear.